I'm probably the last one on the massaged kale bandwagon, and I'm OK with that. Alanna taught me that you could massage olive oil into torn pieces of kale to soften it for a great raw kale salad. What I took a chance on was the idea of using massaged kale in a quickly-cooked dish--would it work? I'm happy to share that it does work. Our fried rice repertoire has now expanded to include kale, and my kids are enjoying kale not only in soup and in pizza dough, but also in fried rice. Green smoothies, too. Tomorrow, the world! This is huge in my book. I mean, my spouse and I enjoy every item in our large CSA share, one way or another. Our farmers are amazing, their land is very productive, and the kids seem to want to eat multiple times a day, so it really works well if I can use the CSA bounty in a way that also feeds my children. Double win! Dribble a small amount of olive oil onto the torn kale, and work it through your fingers, rubbing each leaf to coat with oil. A small amount goes a long way. Set aside. Preheat a large skillet over medium heat, add a turn of cooking oil, and add the eggs. 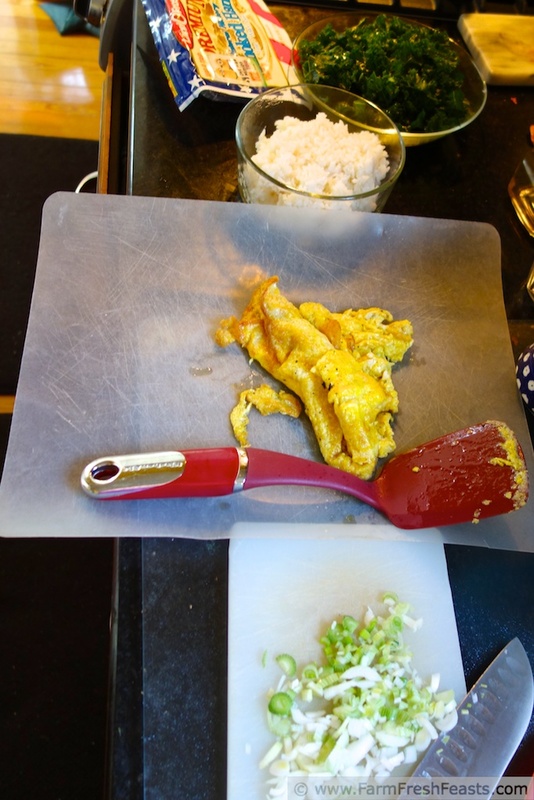 Scramble lazily by ignoring them for the most part, lifting up the cooked edges now and again to let the runny egg flow under, then when there's nothing left to flow, maneuvering a large turner underneath the egg and deftly flipping the entire thing over for a minute to finish. Set aside, and chop into bite-sized pieces while the onions are sautéing. Add a bit more oil to the skillet, and sauté the onions for 3 minutes until they start to soften. Add the kale to the onions, and stir a couple of minutes, then add (optional) ham, egg, and rice to the skillet. Stir to combine, pour vegetable broth over top, and heat through. Anything that gets the fresh greens from the farm share into the kids' bellies is a good thing to me. You get the Kale Award! Congratulations! Really I think there are too many bandwagons available to join, but when there's kale is in the farm share box, I'll take any bandwagon in a storm. Do I win the Mixed Metaphor Award? Looks gorgeous! You're not the last one on the massaged kale bandwagon - I've never massaged my kale. But now you have me intrigued, so I may try it. I'm usually the last to try anything (joined FB in 2012!) but it's good to know there are folks who have not given their fresh greens a good rub down. It's a useful technique and a heck of a lot easier than peeling an acorn squash (another different treatment for a common vegetable), so I'd give massaged kale a try if I were you. I love your description for cooking the eggs. It's exactly how I cook mine too. This is huge. I'm amazed at how many different ways in which your children will eat kale now. Talk about impressive, and I also like the idea of using kale in a hot dish. A little bit of creativity plus a boatload of produce equals great results. You probably don't have to look up how to spell maneuver either, do you? Better said, a little (giant) bit of desperation plus a boatload of produce and a tiny dash of creativity. Wow, can't believe how good that fried rice looks despite the kale! Just kidding, Kirsten! 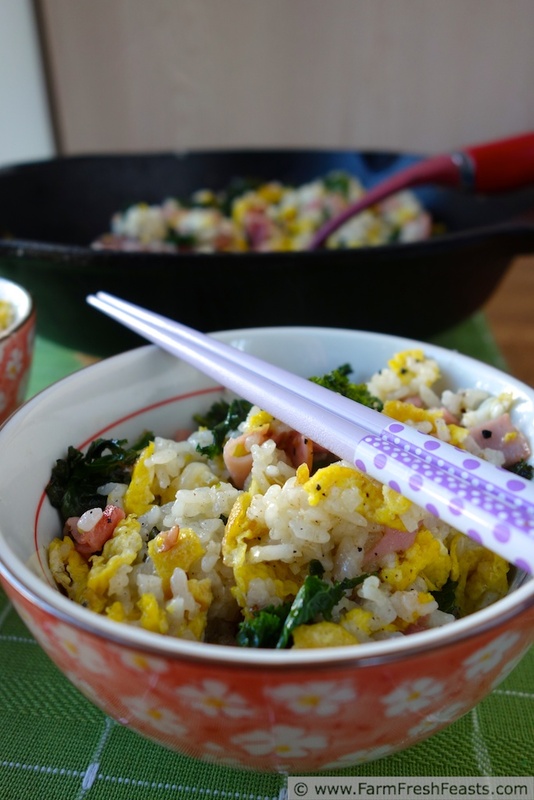 Really I love kale, but never tried it in fried rice, although I've had cabbage. What an ingenious way to incorporate more greens in your meals, bravo! I can see my kids saying the same thing . . . . 'despite the kale'! We just started using kale in our smoothies and I never thought of using it in fried rice. Great idea. I stopped by from Sunny Simple. I admit I prefer spinach to kale in a smoothie, just a flavor thing, but green smoothies are so pretty and fresh. Kristen- thanks for this. I'm teaching a cooking class to beginner cooks at the end of the month and the theme is kale...May I steal this recipe if I credit your blog? You're very welcome to share this recipe--and tell your students there's plenty more kale recipes (soup to pizza) here-all listed under the Visual Recipe Index under Greens. You're not the first, and won't be the last--but I do appreciate you noticing the difference! 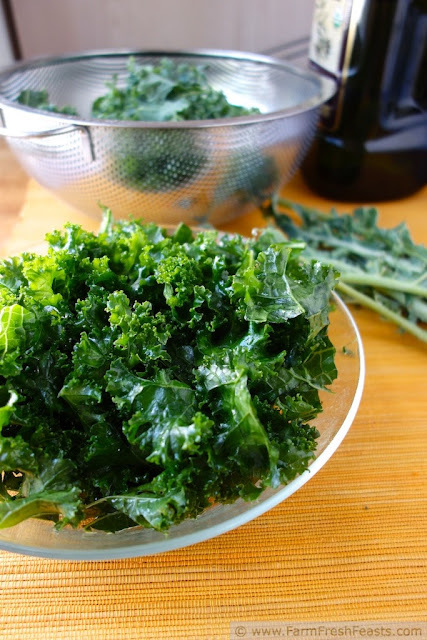 Guess I know what I will be making with my kale this week...thanks for sharing and linking up! It's a tasty recipe. Now I haven't seen kale in a good while--though I've got the prettiest head of Napa cabbage calling to me . . . you whoooooo! Yep--you know if the kids will eat the whole thing that it is a hit.